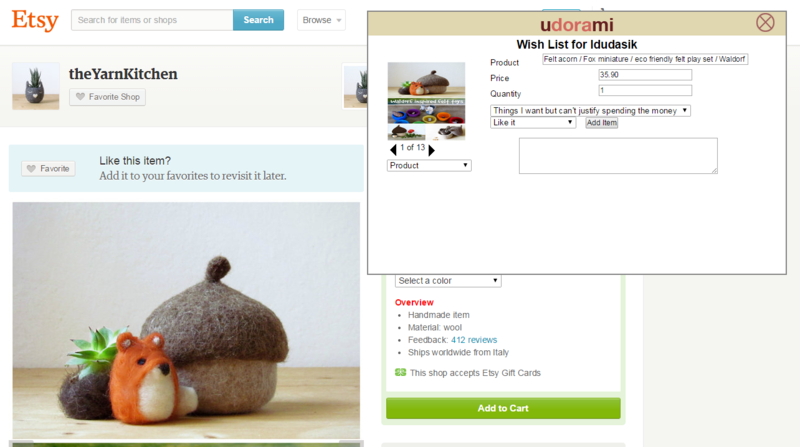 The Udorami button works when you are on a page with a single item. Not necessarily an e-commerce item – just any ‘ole item. When viewing the page, go ahead and click on the Udorami button*. Don’t worry, it won’t navigate you to a new website. Instead, it will open a pop-up box on top of the page where you can start adding the item to your list. *NOTE* You might have to login to Udorami first. If you see the “Please login” notice, go ahead and continue to login. The login page will open in a new tab so you won’t loose the original website with your item on it. If there is more than one image available to use as the item photo in Udorami, then you can scroll through all of the available options using the left and right arrows directly underneath the image in the box. You can move the box around your screen. If you click on the top of the box, you’ll see your cursor change to a move icon: Click and drag the box to any other location you’d like.